Since over a week now I’m reading in the Iowa bird forum that the geese are on the move. 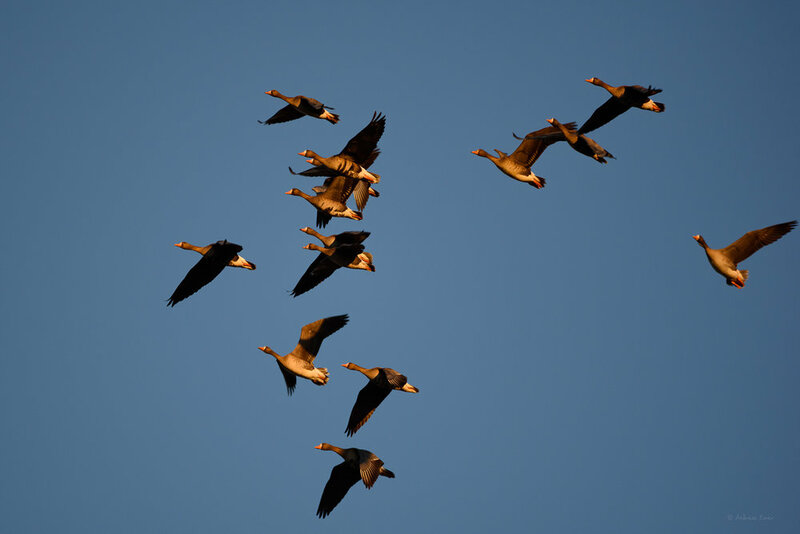 People report hundred-thousands of Snow, Ross, and Greater White-fronted Geese flying over or resting in marshes and wetlands here in Iowa. I saw photos and videos and the number of birds are just stunning. Yesterday I finally saw for the first time a flock of Snow Geese flying over our house and later in the evening Joan and I heard Greater White-fronted Geese in the sky. Their calls are different from the Canada Geese that we have here in the valley all year long. Parts of the Green Island Wetlands in “killer light” this evening. These grasslands and fields around the wetlands provide food and resting places for many migrating birds. For several reasons I haven’t been able to go out and watch the migration of the geese to the arctic and I got really antsy about it. Today I had enough and left my office a little earlier than I’m supposed to and drove down south to the Green Island Wetlands. What a change since the last time I was there on February 18th! The snow is gone completely and probably 80% of the water is open and without ice cover. I saw thousands of Mallards and among them a few Northern Pintails. Too far away for a good photo. A dozen Trumpeter Swans were feeding or rested on the remaining ice. Three Sandhill Cranes took off just in front of me and suddenly I heard the sound of the Red-winged Blackbirds and saw them taking possession of their breeding grounds again. These are all sure signs that the worst part of winter lies behind us. However, I didn’t see a single Snow Goose. But I met Forest, a nice gentleman who works for the Iowa DNR (Department of Natural Resources), and he gave me a hint where he had seen the Greater White-fronted Geese fly in around sunset during the last few days. And this was exactly what happened. Large numbers of geese flew in and searched for a good place to rest. Forest told me he works in the wetlands and spends a lot of time out there but still likes to watch the migrating birds after his work is done. I call this real passion and I’m always thankful for people like him, who share their encounters and knowledge with others.